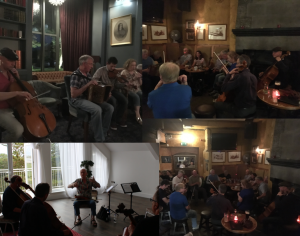 The Irish Cello Retreat, held in the peaceful East Cork setting of Garryvoe is for you, the cellist, to learn how to play Irish music to build on your technique and expand your repertoire. Irish music is a fantastic way to super charge your learning while having fun. The Irish Cello Retreat will give you a chance to learn new fast tunes, gorgeous deep and emotional Slow Airs and ancient melodies. We finish the retreat with a short performance of the music we work on, followed by a wild traditional Irish session. The music packed days will be hosted in the four star Garryvoe Hotel, in a light room with great acoustics and a view of the sea. It’s the perfect environment to soak up the lessons, share ideas and get inspired. We’ll be lunching and dining together in the beautiful Garryvoe Hotel Restaurant and Lighthouse Bistro, and 2 nights heading to traditional sessions in Midleton and Cork City. On the last night we will celebrate after the delicious dinner with a traditional Irish session in the Garryvoe Library. I will help you prepare for the retreat with a personal Skype session and will set you up with instant access to all the valuable bonus online material so you can start improving right away. What is the Irish Cello Retreat all about? It’s about being in a supportive and relaxed environment to learn fun traditional tunes whilst developing technique, style and your unique way to express yourself through the music. Slides, Polkas, Jigs and Reels – Learning stylistic features of Irish music whilst developing a loose, flexible and effortless right hand and arm, and fast left hand fingers. Get loose and fast. The workshops are an enjoyable way to work on your technique and will benefit pieces you already play in an effective and powerful way. To feed your passion for the instrument, and keep your playing fresh it is important to keep expanding your repertoire and styles of playing. Explore! Adding new styles and techniques to your playing helps expand and express your ideas and feelings through the cello. Be inspired with new ideas to create your own arrangements. This is all about getting some great tunes by memory and working them up to speed. We work on loosening up the right hand and speeding up the left hand with practice tips and new ways of looking at technique. A powerful experience with the renowned Master of traditional fiddle playing Matt Cranitch. He will give you tips and direction from his wealth of experience. He will work on the tunes we learned in the morning and help develop the authentic Irish flavour through bowing styles and ornamentation. The gentle art of playing slow airs is all about being free enough in yourself to express a deep emotion. We will look at ways to make your slow playing come alive and you will learn ways to find a great tone and develop your own unique ‘voice’ on the cello. In this session we will be working with slow airs. You will learn how to create your own arrangements with embellishment, variation, drones, experimental techniques and rhythmic ideas. We will also work on a great fast reel! Here we learn how to accompany Irish music using drones, rhythms, chord shapes, pizzicato and chopping. We learn the art of ensemble playing, how to get a great rhythm going, and how to expand these techniques. We will work as duos and trios to create pieces to perform. This is where we bring our fast tunes together to create ‘sets’ to be session ready, and to back each other with accompaniments. We look at how to start and how to end tunes and what is needed to let others know what you intend during a session. We will be session ready for the evenings performance! If you’ve studied my online course or lessons or worked through my Irish music books ‘Trad on Cello’ or ‘Irish Airs for Solo Cello’ or my other sheet music, or dreamed of exploring Irish music, then coming to learn with me is the next step where we can focus on your playing in a secluded environment with no distractions. This is a chance for you to benefit from some tailor made and personalized instruction. When you enroll we will arrange a Skype consultation where we can chat with you and your cello, and assess where you’re at and where you want to go with your cello playing. I’ll then know exactly what we’ll be working on together at the retreat to maximise your results during the retreat and beyond. The last night of the retreat we will play in a live session. This will be a great opportunity to show off your new found skills and confidence as a trad cellist! A great final night party for all to enjoy! Sessions in Garryvoe Library, Wallis’ Bar Midleton and with Matt Cranitch in the workshop room. 2.00pm Workshop #4 Arranging Slow Airs and A Reel! The Location: Garryvoe Hotel, East Cork. 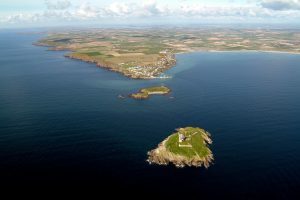 East Cork is a great place to visit on a trip to Ireland, with plenty to do and see. Garryvoe Hotel is a family-owned, independent four star hotel in East Cork. The modern rooms are beautiful, with sea views in most, and the the staff are very friendly and welcoming. Down at Garryvoe Hotel you will experience a peaceful beachside setting to bring clarity to your mind and body. In your spare time you can walk along the sandy five-mile beach, enjoy the Health Club and Swimming Pool, and dine on delicious food. 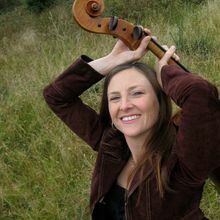 For over sixteen years, Ilse has been developing a repertoire for Irish cello, creating a modern Irish style with strong connections to the past. Her research into Irish Slow Airs was developed into an award winning Irish music film “Living the Tradition”, an enchanting journey into old Irish Airs. She is a passionate instructor and has run many workshops for cellists and other string players over the years. She teaches Chamber Music at University College Cork, conducts the Cork Light Orchestra, plays contemporary ‘deep listening’ music with the Quiet Music Ensemble, works in theatre and plays cello in many different styles, from Irish, Jazz, Rock and Roll to Classical.  YES, I understand spaces are limited so it’s important I act now before registration closes!  YES, I understand Irish Cello Retreat includes one (1) place on the Garryvoe, Ireland 2019 retreat.  YES, I’m ready to take action and learn Irish music by the sea in Ireland! 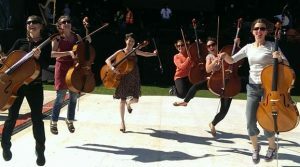  YES, I want to join like minded cellists to achieve new skills and have fun! To prepare you for the Irish Cello Retreat, we are offering a bonus package to get you going on Irish music on the cello! Ilse’s book of traditional Irish tunes with a guide on how to play them and also including second cello parts. Ilse’s book of ten Irish Airs for Solo Cello and CD. Ten beautiful Airs with lots of challenges to work on! 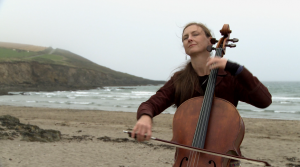 Ilse’s film following her around Ireland as she searches for the origins of ten Irish Airs, from her book Irish Airs for Solo Cello. This is the directors cut film with a second DVD of each air played in full. You will have lifetime access to Ilse’s course Irish Airs for Solo Cello, featuring 31 video lessons for the ten Irish Airs from her book Irish Airs for Solo Cello. Before you get to the workshop you will be sent material to work on to get a head start on the tunes. We will mostly be working away from the sheet music during the three days, so you get a chance to look at some of the tunes and be ready to get them flying during the workshop! We’ll use our first coaching session before the retreat to find out your individual needs and help you with pointers to get ready for your Irish cello adventure. Then sometime after the Irish Cello Retreat we’ll follow up together with a session to help ensure that you’re really able to implement everything we learned together. Why not treat the one you love and bring them along to enjoy the peaceful setting, the craic in the evenings, and soak up the Irish atmosphere? Choose the Partner Package which includes all group meals (breakfasts, lunches, dinners). Feel free to add your partner on at a later date if you want to quickly reserve your own place on the retreat first! Q. When and where does the Irish Cello Retreat take place? A.The Irish Cello Retreat takes place in Garryvoe, East Cork, Ireland, June 2019 Dates TBC. Upon registering we’ll set you up with your Skype session with Ilse to discuss your goals and get you ready for the retreat. A. Yes. You will stay in the stylish four star Garryvoe Hotel, by the sea. A. Yes! Breakfast, Lunches and Dinners are provided. Dinner at the hotel on the first and last night, and the dinner in Midleton on the second night are provided. The Wednesday night in Cork will be your choice of place to eat and explore. We’ll all be hanging out and dining together each day and evening. Q. I’m a beginner to Irish music – is it for me? A. For each of the 5 workshops at the retreat, we will be starting from the beginning. The basics and fundamentals are so important & no one will be left behind. Beginners and newbies are welcome! Sign up before April 1 and I’ll also meet up with you on a private Skype coaching call before the retreat to help get you ready for to make the most of your Irish Cello Retreat experience. Q. How many students will be invited to attend the Irish Cello Retreat? A. I’m limiting this group to maximum 10 so that everyone will receive personal attention and to keep the group small. This way we’ll all learn more in an intimate environment, and have more time to play. A. You can receive a full refund minus any credit card fees within the first 30 days of reserving your place at the retreat. Please consider getting travel insurance to cover unexpected occurrences. A. All you need to bring is your cello and plenty of enthusiasm! Q. Will the Irish Cello Retreat be recorded? A. Yes, the workshop teaching sections of the Irish Cello Retreat will be recorded, and posted privately for you to review in the future. Q. What if I have a question that’s not listed here? Q. What if I can’t bring my cello? A. Don’t worry, if you need a cello in Ireland, let me know and I can arrange to hire or borrow one and it will be at the hotel when you arrive. Q. Where do I fly to? A. I will organise transfers for you from Cork Airport, Cork Kent Train Station, or from the Bus in Cork. Aircoach is the best bus from Dublin, as it is direct from airport and only one stop in Dublin. It takes around 3hrs. You can also take a train from Dublin’s Heuston Station to Cork’s Kent Station. You can email me about any travel questions.